This gorgeous, simple black bean soup came from a dear friend, the late watercolorist/jewelry maker Elsie Freund, who fed it to me countless times. It has been one of my favorite soups for almost forty years. Ned and I served it at our wedding dinner, and I included it in both the Diary Hollow House Cookbook and Diary Hollow House Soup & Bread. It’s even better when reheated the next day. The more olive oil you add, assuming its good, fresh, and extra-virgin, the better it will be. 1. Drain and rinse the beans and place them in a large, heavy soup pot with the stock. Bring to a boil, then turn down the heat to a simmer and drop in the bay leaves and jalapeño. 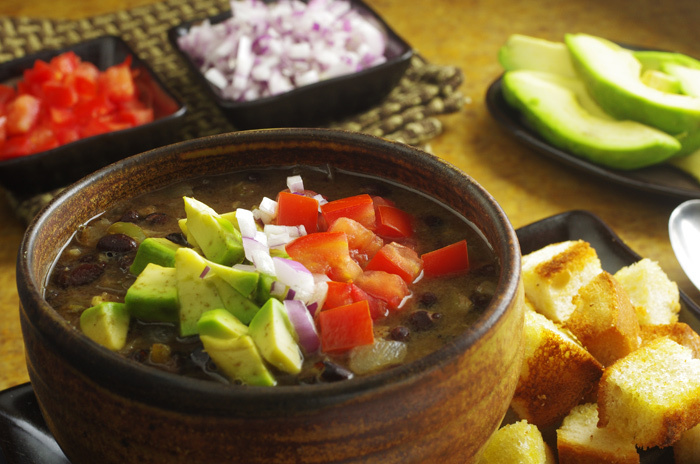 Cover tightly and cook, stirring occasionally, until the beans are tender, 1-1/2 to 2 hours. 2. Toward the end of this period, heat the oil in a large, heavy skillet over medium heat. Add the onions and sauté, stirring, until they begin to become translucent, about 3 minutes. Add the green peppers and continue sautéing for another 3 minutes, then stir in the garlic and cook for another minute. Turn off the heat. 3. When the beans are tender, stir in the onion mixture, add salt to taste, and simmer, slowly, uncovered, to let the flavors meld, at least 20 minutes and longer if you like. Discard the bay leaves and jalapeño. 4. Place some rice and a good sprinkle of red onion into the center of each bowl and ladle the soup over top. It’s even better the next day.